The name synonymous with luxury, Tom Ford is the epitome of modern-day sophistication. Having been credited for reviving Gucci from its "logo laden" past to today's ultra luxe powerhouse, Tom Ford's visionary eye continually reinvents and redefines what beauty means today. The architect turned designer turned director began life in Austin, Texas before enrolling in New York's The New School. After graduating with a degree in interior architecture, the designer quickly shifted his focus to fashion. In 1990, Ford worked as an in-house designer at Gucci before being appointed the brand's Creative Director in 1994. Ford's ability to revive the nearly bankrupt Italian fashion house solidified his place amongst fashion’s elite. After launching his eponymous line in 2006 with an overwhelmingly positive response, Ford continued cultivating his artistic talent by directing the Oscar nominated film, A Single Man. The flamboyant, salacious designer remains at the helm of contemporary glamour by continually producing collections that astound, excite and allure. As a celebrity favorite, Tom Ford's designs are frequently copied by counterfeiters. Knowing key authentication touch points will ensure you've purchased an authentic Tom Ford handbag. As a brand devoted to sourcing the best materials from around the world, Tom Ford handbags are made with only the most luxurious, high-quality leathers and exotic skins available. The most widely used material is calf leather. Though the finish can vary depending upon style (Grain Erre, Raggio Di Sole and Crazy Grain Lux to name a few) the finished product should be heavy yet supple with a distinctive leather scent. Though replicators can easily produce eye-catching leathers, the synthetic odor emitted from these cheap materials is a sure sign of a fake. 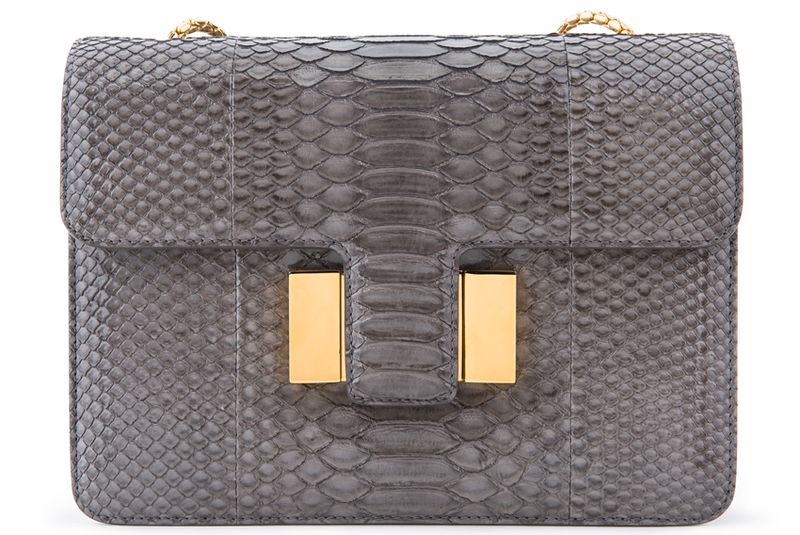 Along with calf leather, Tom Ford uses a variety of materials including alligator, python, pony hair and velvet. Exotic skins should be symmetrically cut and constructed.  Python should give off a "scaly" sound when touched and feature natural inconsistencies. Pony hair and velvet should look lustrous and feel incredibly smooth. Even if a counterfeiter can replicate the look of a bag from the exterior, the lining will almost always be a sure sign of inauthenticity. 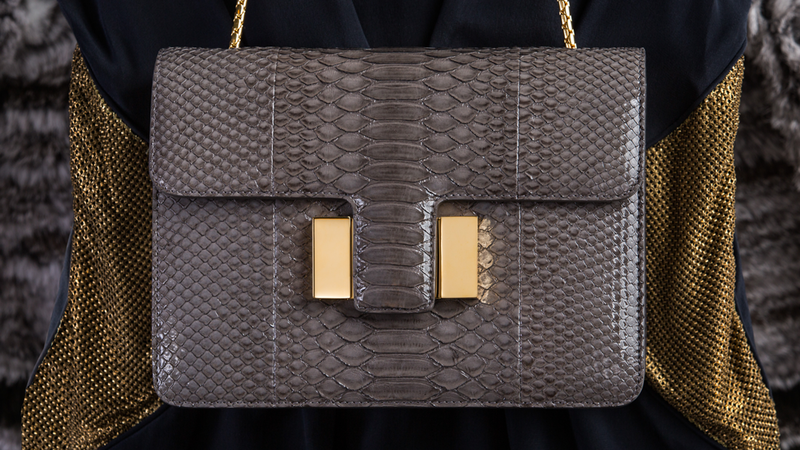 Tom Ford uses four different lining materials for his handbags. These include sheep leather, cotton canvas, microfiber, and silk. The type of lining depends greatly on the specific style of the bag. 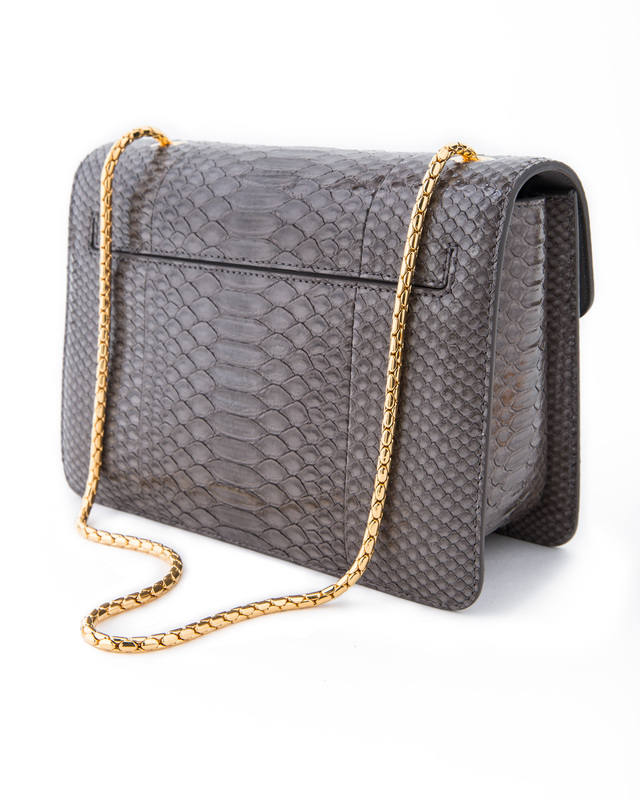 Clutches and evening bags will typically feature sheep leather and silk while practical, everyday styles will feature canvas and microfiber linings for added durability. All linings should be expertly stitched and smooth to the touch. The quality and construction should mirror that of the brand. even and free of inconsistencies. Typically, the stitching should also be the same color as the rest of the handbag. Stitches should align perfectly with the contours and folds of the bag. 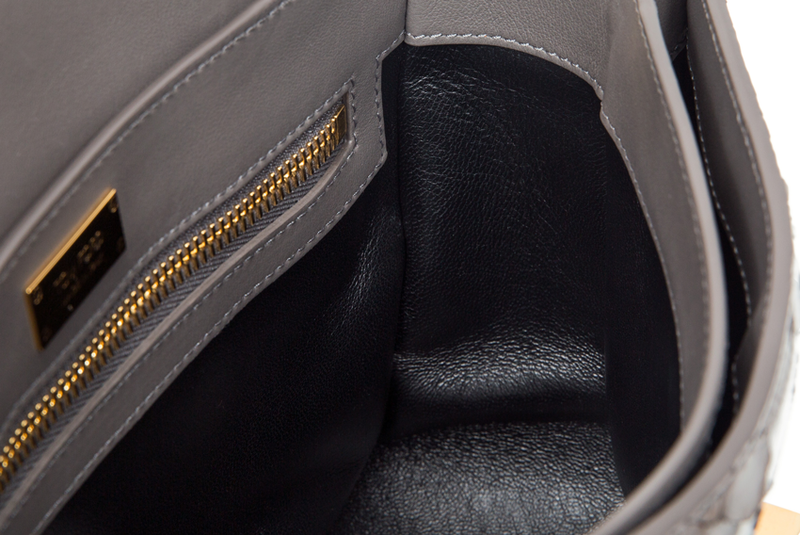 When inspecting a Tom Ford handbag, focus your attention on the corners and seams. These are areas where counterfeiters often take shortcuts in order to keep costs low. If stitching varies in size and shape or looks questionable upon first glance, these are all red flags. The hardware on Tom Ford handbags will be Gold, Ruthenium or Palladium. Every bit of hardware on the bags should match and have substantial weight. Hardware that feels flimsy or plastic-like is inauthentic. Hardware on the Sienna bag should be ultra shiny and smooth. The T-bar and hoop closure should smoothly lock and unlock without hesitation. The snake chain strap should move fluidly without becoming tangled and all screws should be flathead. 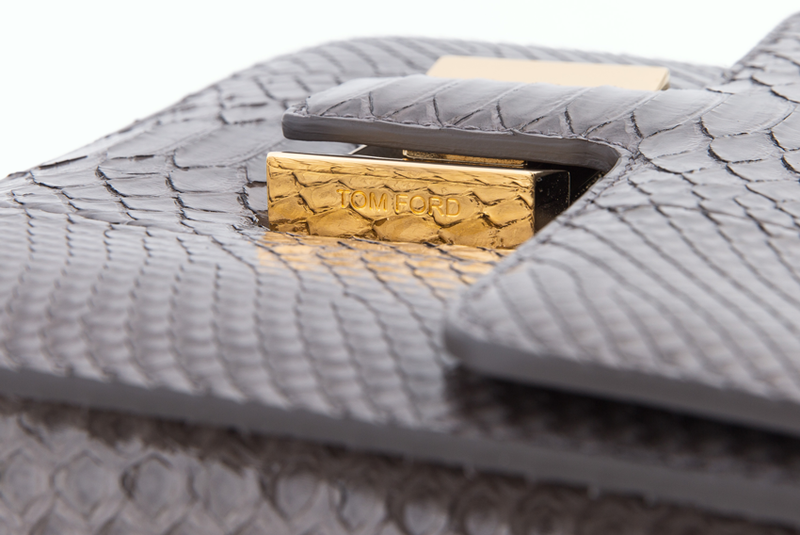 Logos featured on authentic Tom Ford handbags will be engraved or gold stamped. 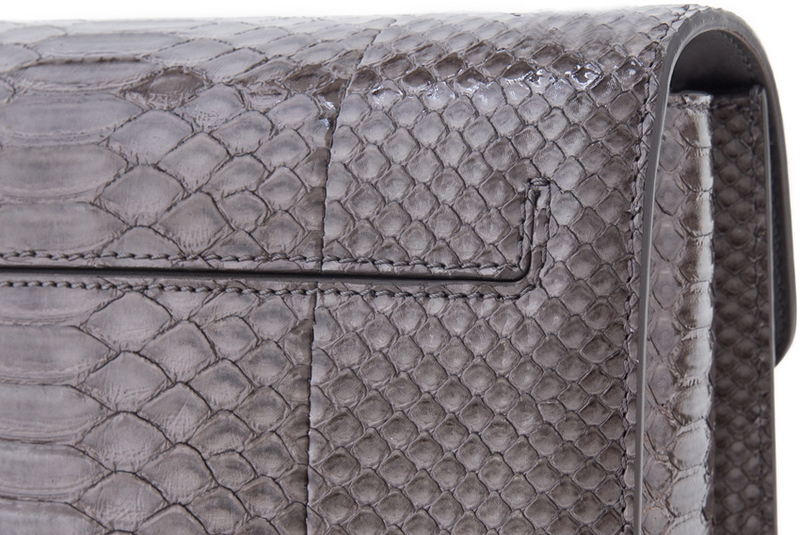 Metal hardware will feature fine engraving reading “TOM FORD” in all uppercase. Turnlock hardware pieces will have “TF” engraved on either end. Gold stamping should be fine and crisp with no inconsistencies. Like engraving, gold stamping should be all uppercase. 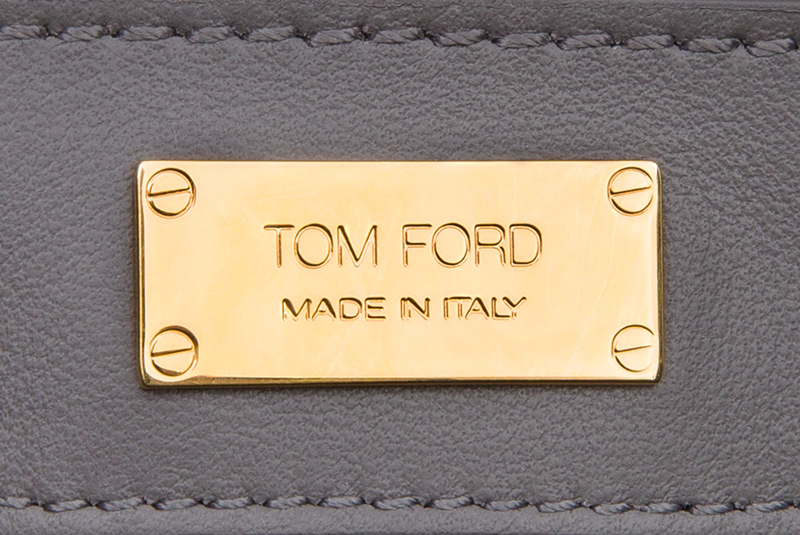 Depending on style and season, logos may have "MADE IN ITALY" placed underneath “TOM FORD". Regardless of style, stamping and engraving should be clean and crisp with all letters having the same size and spacing. Authentic Tom Ford bags are exclusively produced in Italy. A handbag with a label reading "Made in China" or any country other than Italy can immediately be deemed inauthentic.